great job there walter! KUDOS! www.greyscale3di.com "if it ain´t movin´, we can scan it!" One thing I haven't still solved: How can I set the Flash presentation that it has the best initial position to the observer? What I mean: Before we do anything with the mouse we are looking on the backside of the Nokia. And it is angular and not upright. Now with pitch=-70&yaw=157 it's fine. Thanks! ...hier das Kopfstück einer Uhr. gescannt in 20 Positionen (Structured Light). Gesamtdauer inklusive reinigen der Scans 8 Minuten. Gerendert in Cinema 4D. windows 7 quadcore, benq beamer, canon dslr, automatic rotating table. I first scanned the whole area, then took off the existing exhaust, then scanned the bike again, as well as the exhaust. Then i could assembly the exhaust onto the bike without exhaust, and use the full scan as a positional reference. Not my cleanest scan - but not bad for my first effort on this scale. . . .
To be honest, I got bored of cleaning up the scans and aligning them! 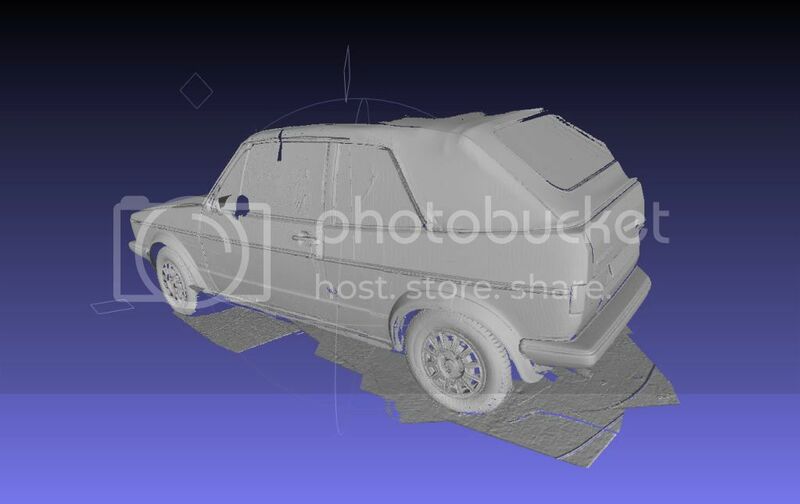 Can you please inform us how you have scanned the Volkswagen Mk1 Golf Cabrio? Means was is sprayed before? What projector and camera was used? How were both devices arranged? One above the other or side by side? What kind of calibration corner was used? Sure thing Walter, here is the tech list! 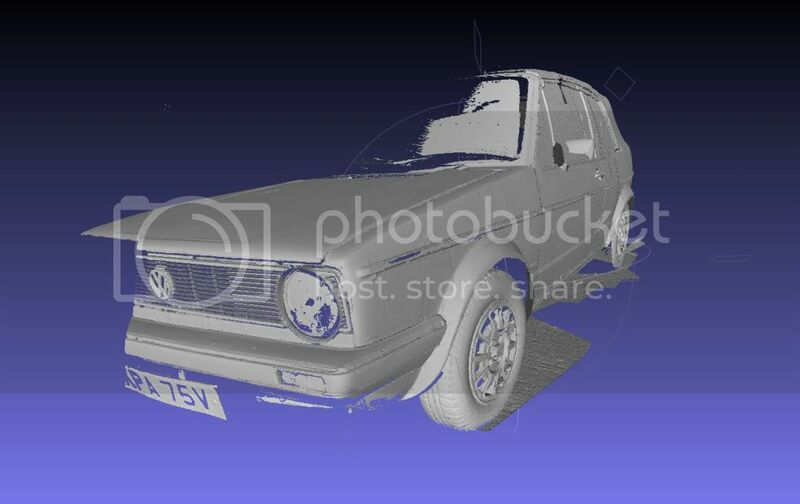 EDIT - The car paintwork was not that shiny but it was black so it was necessary to give a light mist with white spray. 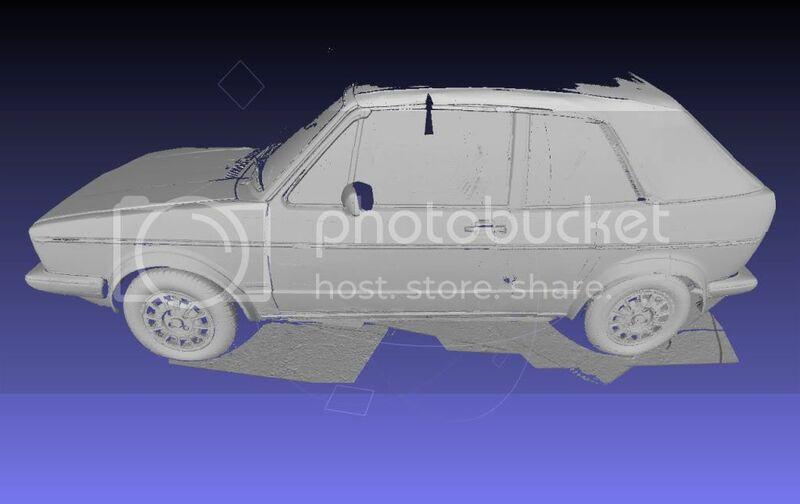 It was scanned in the relative darkness of a barn with the windows partially blocked. Not pitch black but dim - enough to get a good contrast on the projection. Shape fusion worked for the most part but it is really missing the manual alignment IMO. As a first attempt I was most interested in getting distortionless scans and the surface quality was not important but the scans were of a surprising quality for the scale I was working on. I am certain that with more care and a few mods to my rig I can make significant improvements in the surface quality too. my first test with DAVID_3.5.0.3242_beta2 ... well-pleased !! p.s. : here the Dell projector don't work very well... what's your pc's grapich card? Location: Cavaria con Premezzo (VA), Italy. I hope I could help . but here seems that something goes wrong: compared with the ACER K11 the DELL create more noise (linear and regular small waves - probably have some problems with the camera) and have more more distortions (really hard to align the scans). tube, you have perfect scan .. Can you share the picture of hardware setup? 4. If it is true, then send "Z" command to Com11 to save the obj file. Here it might be necessary to check if the scan is completed in 0.5 second intervals or so in a time routine until the scanning is finished. Is this the procedure? Any pointers will be greatly appreciated. Case comEvReceive ' Received RThreshold # of ' chars.